investigating the moral and metaphysical issues central to medical practice and research. To this end, the book offers in its final Part VIII, as an appendix so to speak, a concise introduction to some focal systems and methods of logic that are needed and used throughout. Each line, paragraph, and page of its remaining seven parts relies upon what precedes it and what has been said in Part VIII. The readers, therefore, should study the book systematically following the instructions given in Figure 1 on page 8. In that case, it will prove absolutely self-contained. It does not require any special knowledge and is easily accessible to all interested students. By virtue of its didactic style, the book is also usable in graduate courses in the philosophy of medicine, bioethics, medical ethics, philosophy, medical artificial intelligence, and clinical decision-making. My thanks are due to H. Tristram Engelhardt, Jr., from whom I have learned, among many other things, that the concept of disease says what ought not to be (Engelhardt, 1975, 127). It is thus a deontic concept (from the Greek deon, for "what is binding", "duty") which obliges us to act. Since this normative aspect is dismissed by most physicians and philosophers of medicine alike, initially I wanted to analyze and demonstrate it in what eventually became the present handbook, HAPM, by means of deontic logic. In the process of writing, however, my thoughts extended beyond the concept of disease to the entire field of medicine when I fully recognized the deonticity of the field as a whole in the early 1980s (Sadegh-Zadeh, 1983). Although it is a fascinating feature of medicine that places the institution of health care in the same category as charity, it seems to have been overlooked by philosophers of medicine and medical ethicists until now. I hope they will concern themselves with this issue and discover additional facts about it when they read HAPM. Also, my intellectual debt is to four scholars whose works greatly impacted my way of thinking and my life: Karl Eduard Rothschuh (1908-1984), one of my teachers at the University of Münster in Germany, ignited my love for the philosophy of medicine in 1964 when I was a graduate student of medicine and philosophy; Patrick Suppes's precision in philosophizing taught me analytic philosophy in the late 1960s; Newton C.A. 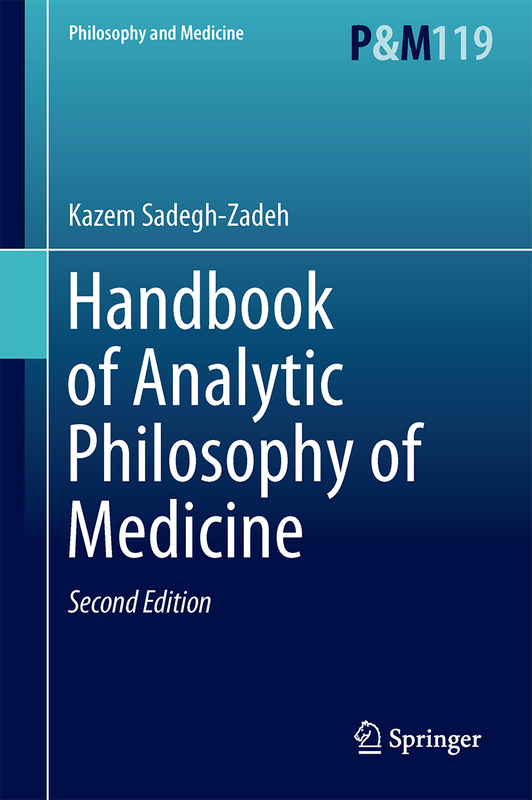 da Costa's paraconsistent logic changed my view of logic and my Weltanschauung in the late 1970s; and Lotfi A. Zadeh's fuzzy logic changed everything anew and inspired me to initiate fuzzy analytic philosophy and methodology of medicine in the early 1980s. I am particularly grateful to my wife, Maria, for surrounding me with so much love and support over the long period of creating HAPM; and to my sons, David and Manuel, for their assistance. Manuel drew the figures. David did extensive LATEX work (references, indexes) and produced, with the aid of MATLAB, the 3D representation of high blood pressure on page 672. I would also like to extend special thanks to the editors of the Philosophy and Medicine for including HAPM in their highly respectable book series, and for excellent supervision, advice, and support; to Mr. Richard Preville in Charlotte, North Carolina, for carefully transforming my imperfect 'German English' into well-readable English; and to Springer for their outstanding production process management. But without the patient and competent work of three anonymous reviewers, none of us would be reading this line right now. I wholeheartedly thank all of them for their thoughtful comments and valuable suggestions.